Kids just LOVE cooking with us, don’t they?! But sometimes, it can get messy! Don’t let that hold you back! 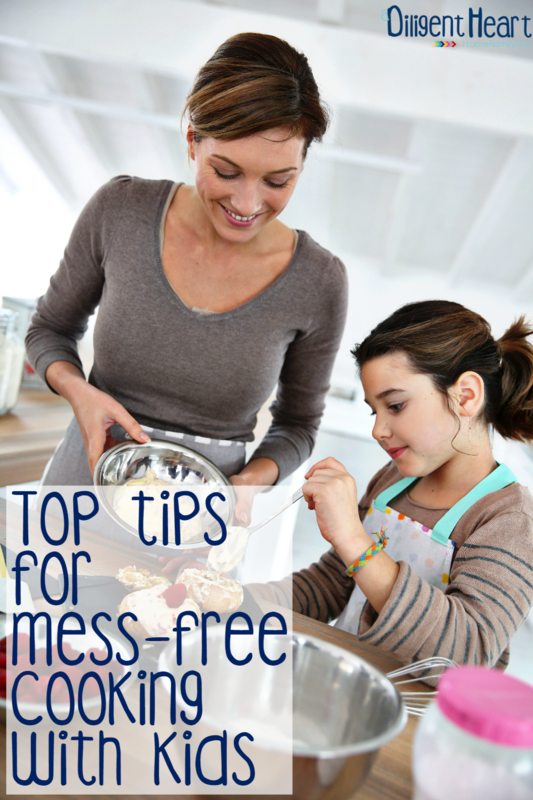 Today, I have a guest blogger sharing some fantastic tips for mess-free cooking with kids! Cooking with children equals mess. Tons of mess. Everywhere. Even in places you never imagined. 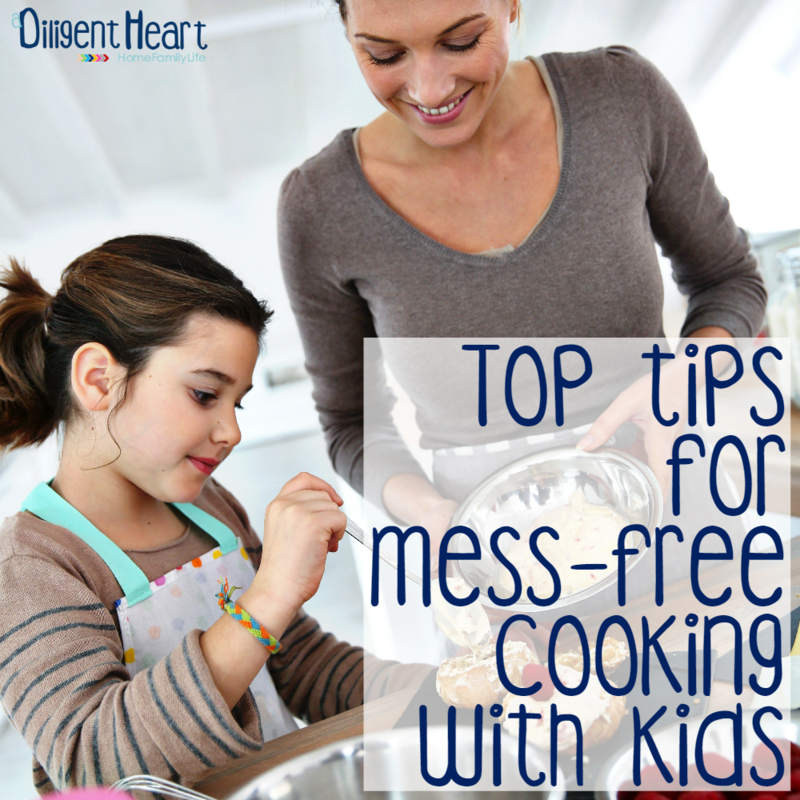 If you are wondering how messy your home can get, let your children help you around the kitchen. But don’t cross off this task without giving it a try. Your children might actually help you cook their favorite meal without hassle or mess. See how to make things the easy way. Your children should know about food hygiene. 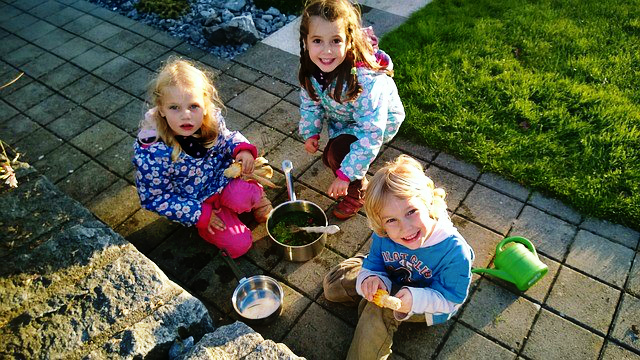 Teach them that they should not touch cooked or raw food with dirty hands. Instruct them to wash their hands before they start cooking with you. 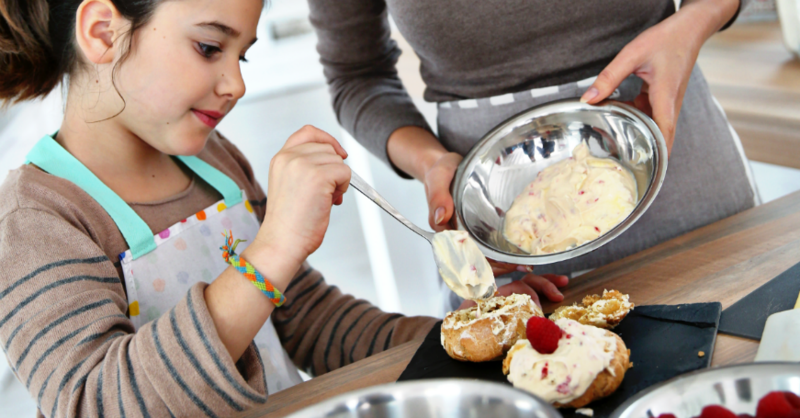 Depending on age, every kid is capable of doing different activities around the kitchen. You know him or her best. Make sure to recognize what he or she can do and assign appropriate tasks. Smaller kids can wash plastic containers, clean the workspace, wash vegetables, crack eggs and taste some of the ingredients. If your children are older, let them chop vegetables, meat and other food. Always supervise them until you know they can do the task on their own. Additionally, they can measure ingredients, set up the table, etc. Children and messes go hand in hand. No matter how hard you try, you can’t protect your home completely. But you can be prepared. Cover all surfaces (floors, countertops, chairs) you are not going to need during the process with newspaper or old sheets. Make sure to move away or lock up all objects that won’t be involved in the cooking. Take all the cutlery, cookware and other items you will need out of the cabinets and place them on the counter tops or table. Use plastic containers where possible to keep breakage to a minimum. You know that lovely red plaid dress your little girl looks so stunning in? She is not going to need it. Make sure it is locked up in the closet while she is cooking with you. Getting ready for this adventure involves dressing appropriately, both you and your children. Put an apron and choose old outfit you don’t have to wash after the cooking session. If your daughter has long hair, tie it back – and yours too. Think about the recipe in advance. What do you want to cook? What meal do you think will be most appropriate and suitable for your children? Search the net for appropriate recipes. Stock up with all ingredients in advance. Perhaps you will want to do some preparation before they join you to save a bigger mess. Think about all this before you take on this adventure. 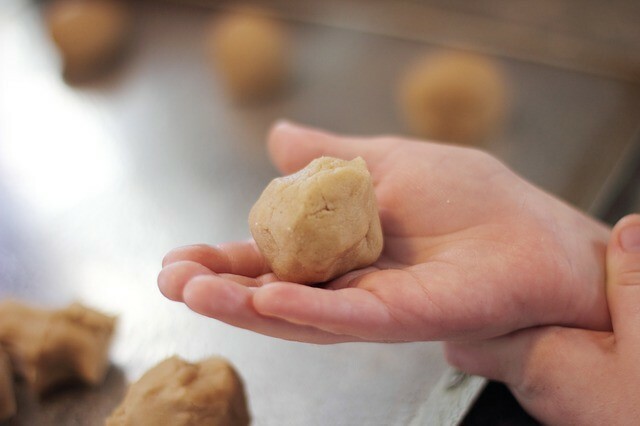 Before you start this whole cooking adventure with your kids, let them know you are going to need them throughout the whole experience, even after. Now might be a great time to teach them that they have to clean up their own messes. And that cooking is not solely about food preparation but that it involves cleaning as well. When you start cooking together, they will be more careful. Of course, they are still small and they are going to make mistakes. Don’t yell at them. You want to make this a lovely moment, not a gruesome day. Tip: Talk through the process. Explain to your children what they should do. If your children can read, ask them to read the steps for you. That way they can practice reading along with cooking. One last tip: Relax. Cooking should be fun. If you are nervous, you will ruin it. When children are involved, learn to expect a little bit of mess. It is all part of being underage. Good luck! The tips are provided by PromptCleaners Cricklewood.